"When we inherited this antique buffet that’s been in the family since the 1870’s, we knew we wanted to preserve our heritage. We asked Nick at Mister Restoration to do the work, not knowing what was under all those layers of paint. As the “after” picture shows, the results were magnificent!! Here are some examples of recently completed work - have a look at our refinished furniture samples and our new section of upholstered furniture. Also, we can finish new furniture for you. 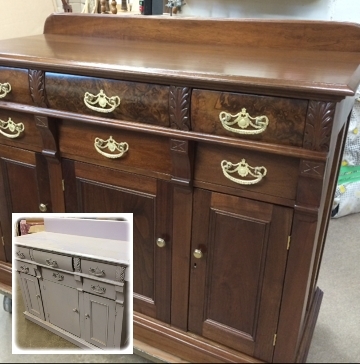 See our gallery, "Unfinished" - this is new, unfinished furniture which we finish to your specifications.